For the carry pouch, you can fasten it on the handlebar or other part of the bike. Very convenient to carry. 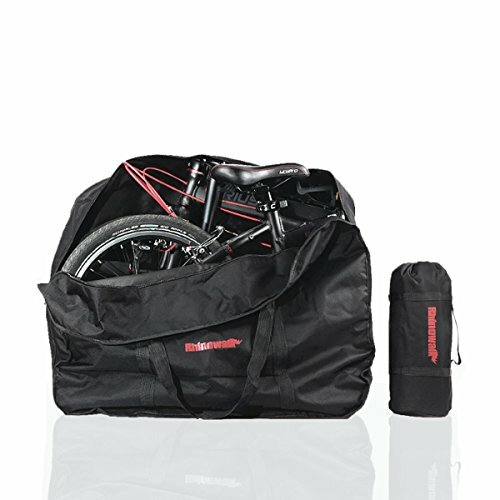 Unfold the bike bag, it can be used as a picnic pad. With the adjustable strap, the bag can be carried on shoulders. Outer pocket: Small accessories can be put there. Suitable for 14-inch to 20-inch folding bike. easy to carry, travel, and storage. Any question about the purchase,Pls feel free to let us know.We will provide best product and service to all our customer. Material:Thicken 600D double layer polyester fibre. Fit for 14'' to 20'' folding bikes. Different Uses:The bag can be carried on shoulders with the adjustable strap.Also can be used as a picnic pad. If you have any questions about this product by AMOMO, contact us by completing and submitting the form below. If you are looking for a specif part number, please include it with your message.